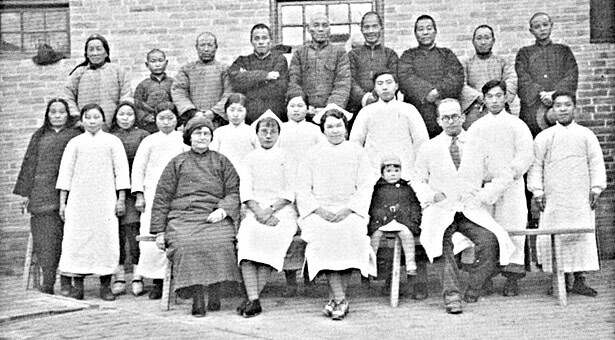 Nurse Lydia Green (center, seated) and her husband, Dr. John D. Green (seated, far right) served in China before World War II at Grinnell Memorial Hospital in China, writes Dr. Donald Anderson '68. Above is a 1936 mission staff group photo. In the current Response, Pg 52: the photo is of Prof. Lydia Green, who founded the School of Nursing at SPU almost 50 years ago. As Nurse & wife of Dr. John D. Green, she served in China before World War II at Grinnell Memorial Hosp. in China. See 1936 mission staff group photo pg 57 in book: Geneva: The Fascinating Story of Geneva Sayre by Glen Williamson, Light & Life Press 1974. (Photo above.) The Green family escaped on the last train out before the mission was overrun by the conquering Japanese army. They returned to McPherson, Kansas, where John developed a practice and was also school Physician for Central College until his death in 1947. In establishing the quality School of Nursing at SPU, Lydia's (and Dr. John’s) vision of medical mission service has, in effect over the years been multiplied exponentially, reaching near and far — thanks to the dedication of faculty, staff, and students who are now performing according to that same Christian vision. This beautiful lady is Lydia Green. She was one of the first people I met at SPU in 1962 when I worked towards a BS in Nursing. It was a real privilege to know this remarkable woman of God. What a lovely photo of Lydia Green. She was my advisor and a really lovely person. Always friendly with a smile on her face. She was the Director of Nursing Services when I was a nursing student. I remember Lydia Green invited all the nursing students to dinner at her house once. She told us about her experiences on the mission field. She had a child die there also. I loved her, was afraid of her and respected her all at the same time. My good friend Kathy Glass Stewart ’71 and I used to walk around campus complaining about how tough Lydia Green made our lives. I will be ending my long career as a school nurse in the Longview School District this year, and I consider Lydia Green a large part of my success in school nursing. She was someone I admired from the time I was a young girl visiting my dad on campus. She was the Dean of Nursing when I was a student at SPU. She had the respect of all nursing students and was dedicated to her profession as a nursing educator. She was a student advocate and even followed her graduates after they became RNs. I was one graduate she followed up with and will forever be grateful for the advice she gave me. My husband was a new Christian and contemplating enrolling in a Christian college to learn more about the Bible. Mrs. Green said, “Well, there is no finer school than SPC to learn about the Bible.” That was 1970. We quit our jobs, my husband enrolled in SPC, and we moved back to Seattle within 2 months! Our life story would have taken a completely different tack had it not been for Mrs. Green. I remember the Green building, as my mom (Professor Emeritus Dr. Emily Hitchens) had an office there. I don't know if it was officially the Green Building or not, but I remember it that way. I have fond memories of that time! How could I ever forget Lydia Green! She was the Dean of the School of Nursing and my adviser during my four years at Seattle Pacific. The nurse in the picture is Lydia Green. Because of her I attended all 4 years at SPU and was one of the original six who graduated with a BSN in 1967. That is Ms. Green, head of the nursing program in 1954-56 when I attended SPU. A great lady that I knew even though I was in the Education/Music department. The nurse is Lydia Green. Her daughter and I were best friends in grade school at North Queen Anne Elementary. Lydia Green directed the nursing program for the class of Basic '48s (at time connected with UW). I remember Mrs. Green well as she was also in charge of the Student Health Clinic and I was a patient there. I was also the president of the nursing student group, so had many visits with her. She was a great encourager for me as I was preparing for foreign missionary service and was a strong promoter and spiritual leader. She gave me great memories of my years spent there. The nursing leader from Seattle Pacific pictured in the autumn issue of Response is Lydia Green! I want to say thanks for creating such a great magazine for Alums. “From the Archives” is a fun addition to Response. I read it cover to cover each month! Keep up the great reading for us! The mystery picture is Lydia Green, long-time head of the nursing program at SPC. When Dad was president, he encouraged Lydia to apply for accreditation of the nursing school. Her application succeeded! Lydia Green was a wonderful model, teacher, and mentor to those of beginning in the field of medical health. But when Dr. Green gave us an orange and a needle and said she would now teach us to give shots, I felt my nursing future was over. I realized later that I was not called to the clinical side of medical care but to the chaplaincy, which then I did not know existed. But I always remember Lydia Green with fondness as the model of the perfect nurse and one who trained many of my classmates, just not me after the first year. Her daughter Joni and I became friends and I even wore her wedding gown when I married in 1963. I came to SPC in 1951 and after graduation there were many years that I contributed to the Lydia Green Scholarship. I have wonderful memories of Mrs. Green who challenged, encouraged, and inspired me. The picture of Lydia Green brings back many memories. I was a nursing student in 1959 in a class of 11 students. We had to transfer after 2 years to UW because SPU didn't have a four-year nursing course. She was my first nursing instructor at SPU before it was SPU and before the nursing school started. We took some basics then and had to transfer to UW to finish our nursing. I recognized her right off. I'm responding for my mom, Amy File Green ’46, who attended SPC's nursing program in 1945. As soon as she got the Response magazine, she saw the photo and knew the faculty nurse in your archives was named Lydia.